Amazing multi-color design with an alternating pattern. Shown here with an embroidered quilted coverlet. 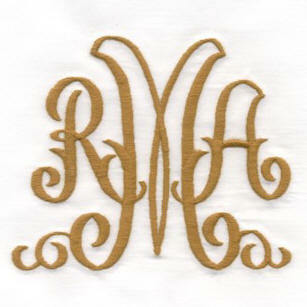 Custom embroidered on Egyptian Cotton or Fine Pique. The heavier weight Buckeye and Dakota Pique fabrics are perfect for daily use. All Sheeting and Pique fabrics are available in White or Ivory with your choice of embroidery color. Sheet Sets include 1 Fitted, 1 Flat and 1 Pair of Cases. Twin Sheet Sets include 1 Single Case. See Size Guideline Below. Deep Pocket Fitted Sheets. Euro Shams and Bed Coverlets available quilted or unquilted. 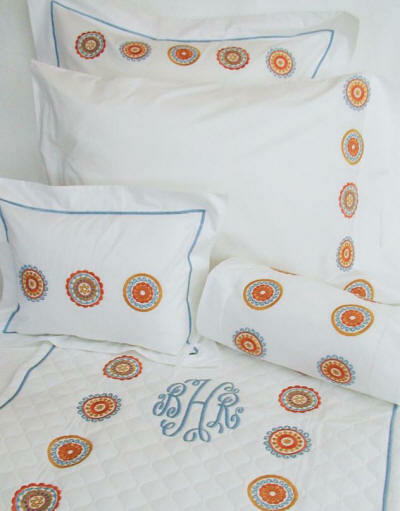 Euro, Standard, Boudoir Shams and Pique Coverlets are outlined along the flange and hem with one line of embroidery. Custom Colors are available. Please call for assistance or to mail your color swatches to us to coordinate threads.